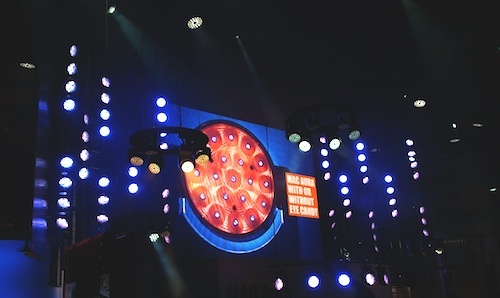 Armed with nothing but a well worn pair of shoes and four days supply of anti-migraine pills, On Stage Lighting hits Earl’s Court in London for the 2011 assault on the senses that is the PLASA show. 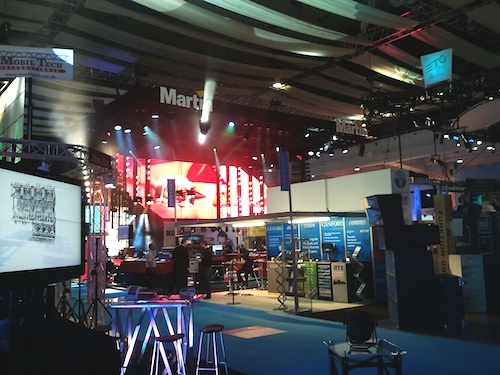 If previous PLASA shows were an indicator of the direction of travel in style, visitors to the PLASA (Promotion of LEDs And Screens Ad nauseum) show 2011 were going to have to steel themselves. At past shows, in order to keep the nausea at bay, you simply had to pace yourself, avoid protracted stints on any stands serving beer and decline the strange coloured cocktails that Avolites might offer. This year, the unsuspecting punter at Earl’s Court also had to deal with two halls full of exhibitors trying to induce various forms of visually stimulated ill health with their products. Despite being a few stands bit heavy on the sub, it actually seemed quieter this year in audio terms – light was the weapon of choice. OK, so LED lighting technology has been developing rapidly in recent years and previous shows have featured an increasing number of LED based products. 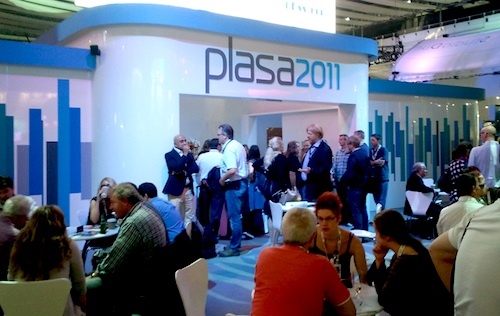 PLASA 2011 (the Chinese year of the LED, apparently) often seemed about little else. This is especially true when you take into account the fact that designers of digital audio desks are now stuffing them full of colour changing illuminated bits everywhere in an order not to be outdone by the lampies. Don’t you wish you’d bought those shares in, well, whatever it is that they put in those chips that makes them light up, now? 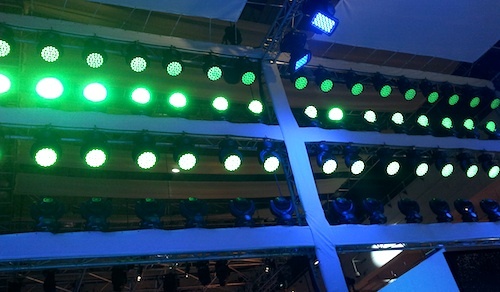 PLASA shows have seen plenty of LED wash lights, moving LED wash lights, LED arrays and panels and this year was no exception. The improvements in colour rendition, the continuation of development of multi LED colour systems like the ETC Selador and others, the use of warm white, cool white and what the Americans call toonable white, continues. This has led (ahem) to cutting edge LED driven fixtures being used in all genres of the industry and most notably in television. This is significant because TV lighting is particularly picky when it comes to things like CRI and colour temperature, multi chromatic shadows and the flicker on camera caused by fixtures that dim using Pulse Width Modulation (PWM) – as LEDs do. 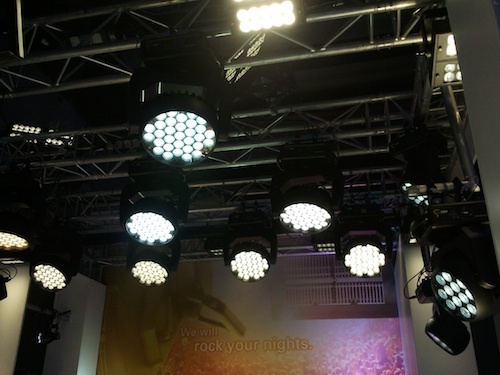 The adoption of LEDs in the TV industry was demonstrated by the excellent LED Shootout area, organised by Paul Middleton and others from the Society of Television Lighting and Design (STLD) which had demos, seminars and the opportunity to see a choice of over 80 LED fixtures in use. 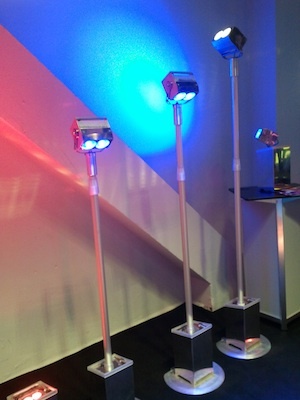 While the title of “shootout” suggests a quest for the ultimate in LED product, the stand followed the STLD ethos of the free exchange of ideas between lighting directors and was more of an opportunity to consider the options, rather than find the killer fixture, and to share best practice. Useful. The perceived holy grail in LED based fixtures was genuine point light sources, either multi coloured or not, in order to produce an LED based profile spot (lekos, in the US) and also an LED fresnel replacement. 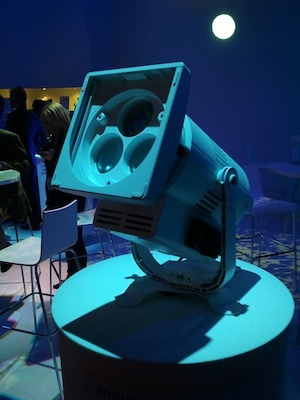 PLASA 2011 was where a clutch of these things came to the party and joined the few already in this space such as the Robert Juliat Aledin, and really showed us that LED and high quality optical systems were a reality and a long way from the horrors of El Cheapo units. In terms of form factor, Coemar and Strong profile offerings seemed familiar in appearance if not quite light output of a 750w HPL loaded Source Four. In the “bright and sharp” stakes, the Prism RevEAL garnered a lot of interest due to it’s extremely punchy output and high quality optics – and not the fact that it’s large size and shape made it look like something that would make your average Ann Summer’s customer eyes water. Prism were showing in the ever expanding White Light Zone, confirming the WL strategy of partnering their way to the top with JB Lighting, iPix, Core, Coemar, W-DMX and Arkaos, with popular MD Bryan Raven smiling down benignly on the hub of activity that is the White Light bar. 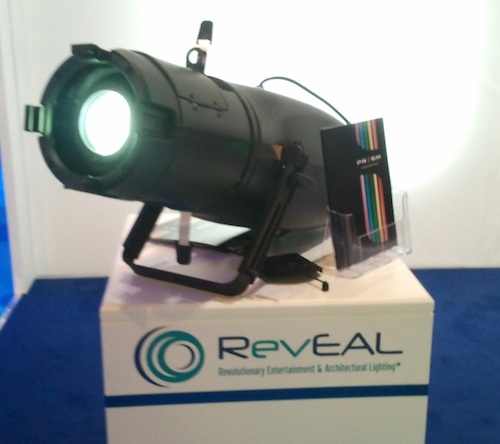 Along with the RJ, Philips Selecon and others were displaying LED based fixed washlight / fresnel replacement fixtures either with familiar stepped lenses or not. Everyone had an cannon of LED wash lights, often moving yoke, aimed at a particular market – and more often than not, right in our eyes. Particular thanks go to Clay Paky, Martin and Robe for that, plus an additional shout out to Avolites who had managed to program a flying purple splodge that kept assaulting anyone that dared to try to study the demo screen in their AI media server area. Anyone playing “Spot the conventional” might have stopped by the ETC stand to look at the Source Four fresnel, the answer to the question of how you mount a lamp designed to be used axially in a base-down fixture design. Like many lanterns past and present, the Achilles heel seemed to be the focus mech, that had only been on the stand a day by the time we tried it and was looking a little awkward in terms of design and snagging – not an issue with just this fixture I might add, but plenty of others from other stables. The overly complex colour runner door latch thingys were also bust by then. Back at the Avolites stand, an excellent demo-er took me through the new pixel mapping features of their Titan control platform which also gave me an opportunity to see Avo really getting there after a shaky start on their journey into modern control platforms. The key to Avolites products is their simplicity, hands on use and visual nature and with Titan they finally seem to have managed to claw back some of the Avo Way while offering the things that a modern LD wants from their controller. Titan now looks more intuitive, complete and attractive (LD attractive, not just shiny graphics) than earlier incarnations and the hardware in the form of a working Sapphire Touch plus Tiger Touches and Pearl Expert were showing off it’s chops, along with Titan Mobile hardware and some posh touchscreens. Their solid dimmers stood stoically by, including the great Power Cube that has been around a little while, even though the mention of RDM induced a coughing fit. The Avo Life didn’t yet seem to extend to the AI media server which Avolites have bought the rights in a strategic partnership with Immersive Ltd. which looks like a fantastic piece of software for the Aspergic but didn’t have an ounce of Avo ease of use stamped on it. 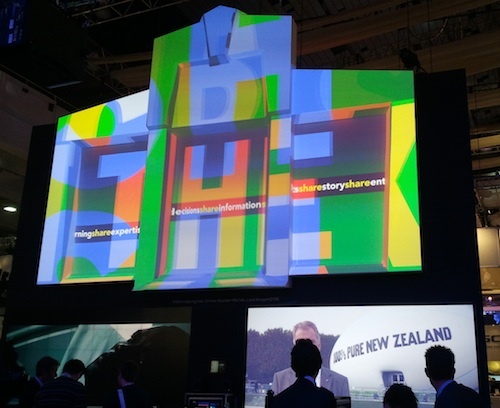 Whether complex projection mapping and rendering is a good fit with the Avo brand isn’t totally clear to me. But it’s early days and in recent years, Avo have demonstrated that while they might falter in early moves, they are cabable of ironing out the wrinkles even though it’s done in public. The carrier bag pushing beauties didn’t seem to outnumber the number of Avo people that actually knew something this year. In other stories of ever increasing complexity, the wonderfully visual Vista with it’s Bryon release software is beginning to look devilishly complicated to the untrained eye. Seemingly more menus, buttons, screen areas and sub layers to keep up with increasing features and tool sets, one can’t help but wonder if we shouldn’t be looking elsewhere for inspiration in our interaction surfaces. And keeping it simple. This theme was touch on by self confessed data junkie Rob Halliday in his seminar on lighting control, who actually simply called for more intelligent use of data within consoles. A small element of this features in my own personal nemesis, the Strand Palette. Given his console history, it’s hardly surprising that Rob is at his most comfortable with a numeric keypad and a spreadsheet on screen and still many of our current forays into the multi touch environment only really augment what are essentially way of presenting data and manipulating it. 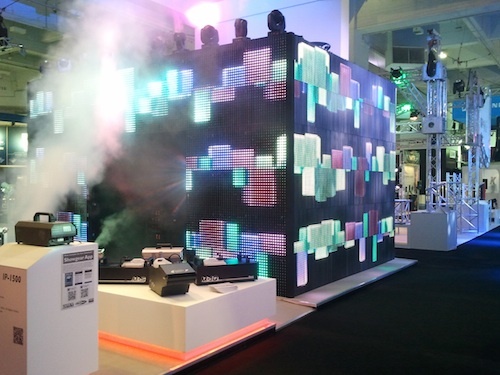 On other stands at PLASA, we saw the Emulator DJ software used with a large rear projected touch surface or the rather fun Interactive Visions media projection and interaction on a tabletop or floor. While maybe in lighting all we need is an iPad, the idea of giving the Lighting Designer the tools to create without data manipulation being so intrusive, is an attractive one. The notion that technology innovation might be driving the design was a theme covered at an ALD seminar on the “The Next 50 Years” in lighting, held in a back room while out on the show floor that technology continued to assault the senses. Future gazing and self contemplation was a feature which ever side of the fence you were on, certain quarters hankering for the good old days of Patt 264s (What???? They were horrible and everyone said so at the time!!!!). Certainly everyone was looking forward, whether vying to have the brightest, modernist LED fixture or discussing the Quality of Light. During a lull in the reminiscing and misty eyed eulogies for the Pattern 23, it was back to the floor to look at what the kit makers had brought us for “Going Back To School” in lighting control. ETC were showing their new Gio console, the one that is more portable than the EOS but bigger than the Ion. It’s common for touring theatre shows to program on an EOS and tour with an Ion, gone are the days when the show just schlepped about the UK with a Strand 500 series show disk. The Gio looked attractive with a sensible desk footprint and is nicely made to stay together while touring. I can think of a few smaller theatres that would perhaps prefer something a little more than their recently purchased Ion, maybe ETC should run a buyback scheme! If small was your thing, the Cham Sys M60 filled in the gap between their PC wings and a full size MagicQ console, with a familiar set of hardware including a smaller touchscreen that looked nice. Ham fisted programmers might see the benefit of the old fashioned “Hog Ops Pencil” (a pencil with an eraser at both ends) to help them with their prodding. 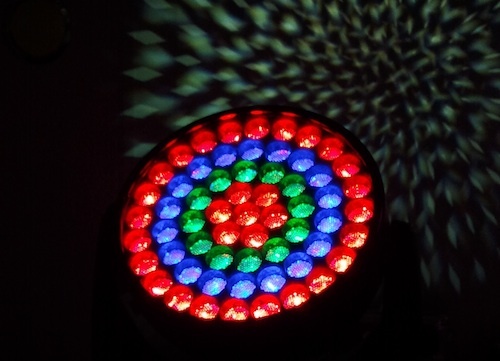 Along with the visual barrage from the waggly LED wash light brigade, more eyeball battering came from the large number of hi resolution module LED based screens – more than ever before. 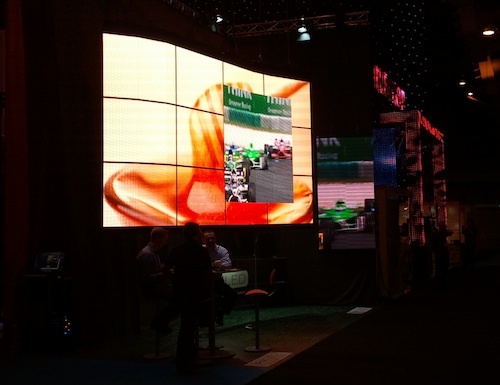 In the past, large walls of lower res stuff have provided colourful displays but PLASA 2011 was increasing about quality content rendering on panels made up of clip together modules. 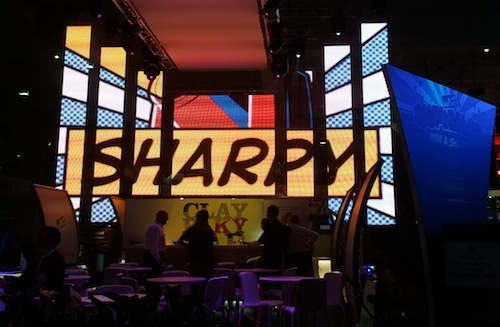 The LED craze in screens too meant that the fashion for projected things waned, apart from a few small pockets where the media server guys showed off their projection mapping capabilities. If forced to predict something that would be a whole lot more evident next year, it would be the area of 3D projection mapping and larger scale displays of this. Along with the usual Hippotizer, Pandora’s Box and the aforementioned Avo AI servers, Earls Court 2 saw the commercial version of the well regarded D3 system used on many shows including running the central LED screen on U2s 360 tour. On Stage Lighting spent four days asking this very question of everyone, from some of the biggest luminaries in lighting to young BTEC students coming for a day out. 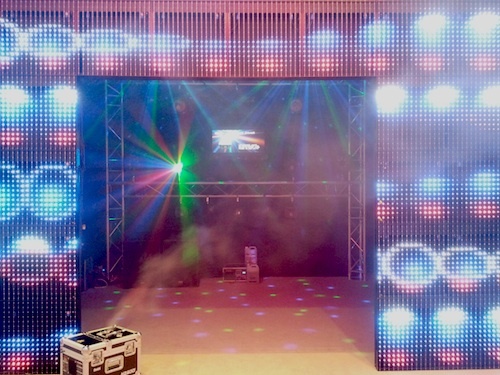 For all the square footage of shiny toys, no single item or trend was cited as floating the boat of the punters, despite the leaps in technology and showing of “new” things such as a profile spot, albeit an LED based fixture. Perhaps PLASA goers will have to wait until next year for that life changing new thing. That isn’t to damn the show as a waste of time, as there was plenty of opportunity for networking and future gazing which leads to the shaping of our industry. And hey, it’s fun once you’ve found a quiet corner away from the strobing to recover and just talk to good friends. A lot of those friends were wondering what the future in performance lighting might look like, and despite the stands telling us that they were it, many didn’t seem that sure. Others talked of disconnect between manufacturers and users, even between the needs of distinct genres and the production of fixtures that are supposed to please every market. TV seemed happy with their LEDs in the studio, the Rock and Roll guys will be loving the new iPix colour mixing LED ACL bars while many theatre users just seem to wish it would all go away and stop making so much noise so they can dust off the 264s. That doesn’t include the RSC, who have embraced the modern lighting world and even invented a solution to their specific problem – the RSC LightLock, which was there again. A particularly big trend that is interesting to me, following on from PLASA last year, is the use of batteries and wireless DMX. Initially what I would call the “Plonk and Play” wall washers from GDS, Core LED, iPix et al, the totally portable market is growing to integrate push up stands (GDS again) and features that make a wireless way of life more possible. The start of a trend for modular (different heads, same power base), “come to pieces” kit that allows for the light source to be sited separately from it’s normally attached power and control station, give the LED/Battery/Wireless DMX solution a load more flexibility. Add this to the fact that, despite it’s challenges, all the major players in Wireless DMX solutions (W-DMX, City Theatrical and Lumen Radio) seem to have cracked the timing issues associated with sending RDM DMX over a wireless system – it’s all very interesting in the truly portable market. Perhaps our shows will be a lot less wire heavy in the future, particularly at ground level where cable management can be an issue. Once the brochures had been put in the recycling and the last motor had been boxed in Earl’s Court, the key take away from PLASA 2011 was how tiring the show is becoming to attend on a sensory level. I’m sure exhibitors found it more tiring than ever, I certainly did. It’s worth the exhibitors remembering that the kind of lighting, sound and media that you reserve for a few hours of spectacle during a single show is not a good environment to do business in over four days. 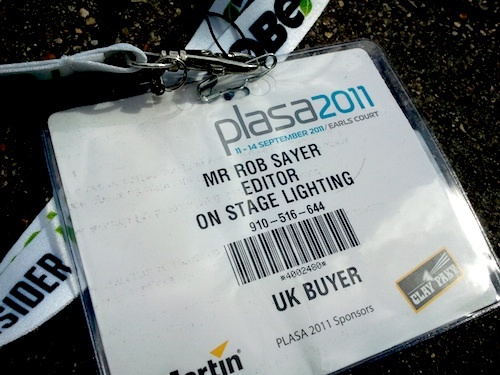 Did you attend PLASA 2011? Got anything you’d like to add, stuff you liked or hated? Comments in the box as usual, we’d love to hear your thoughts. Observations on it being a little light on sound are very true indeed. Likewise just how demanding it is being in that environment all day. Glad I wasn’t on a stand this year. One year, I’ll actually remember to catch up with you for a drink.